The other day I was talking with a fellow mother of a child with Down syndrome about how we can raise our typically developing children to be loving and compassionate towards their sibling with special needs. There seems to be a genuine concern among parents of little ones that their typically developing children will end up resenting their chromosomally enhanced sibling. I can honestly say that in my experience growing up in the special needs community, resentment has not been the prevailing sentiment. I think I have some understanding as to why and as to what parents can do to encourage healthy sibling relationships. When I was reflecting on my experience growing up in the special needs community, I started thinking about other siblings that I know. I thought about my experiences at Special Olympics track and field events. I thought about Special Olympics bowling. I thought about Leanne's special needs religion class. 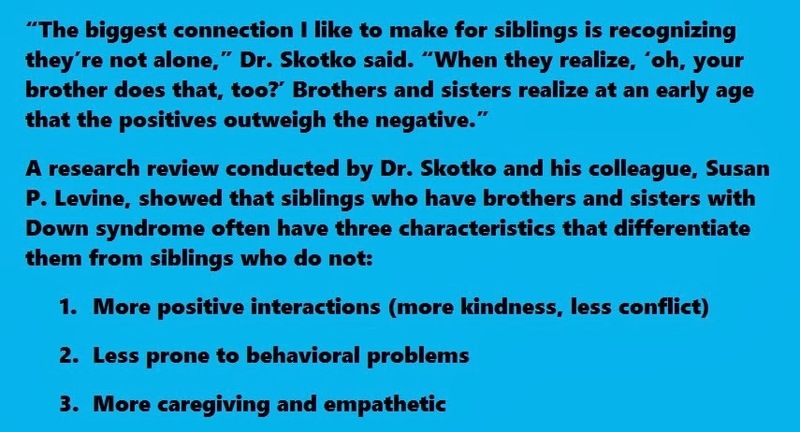 I thought about my volunteer work at various charities that benefit individuals with special needs and I realized, to Dr. Skotko's point, that I was not alone. I was literally submerged in the special needs community. I saw all kinds of people with all kinds of disabilities. I knew all kinds of families who had a chromosomally enhanced family member. And I realized they were living the same "normal" that I was. The summer before we adopted Josie, I volunteered at a summer camp for kids with special needs and I was struck by how many other siblings (mostly teenagers) also volunteered. They were paired up with different campers (not their own sibling) but I was amazed at how mature, compassionate, and capable these teenagers were! I remember one young man whose brother has autism talking to another camper who refused to get off the bus. He was so confident and composed and the camper truly responded to him. I saw another scenario in which a young man whose sister had significant physical and cognitive delays was paired up with a rambunctious young camper with Down syndrome. This little guy was a handful to say the least. There was one scenario by the lake where the camper's impulsivity could have become dangerous and his staff partner exhibited such an impressive display of unwavering authority - firmly establishing a boundary communicating to the camper that he needed to listen and cooperate - but it was wrapped in this instinctive sensitivity. I just stood back in awe at how the obstinate little camper softened and his determination to test boundaries was immediately replaced by a desire to make his staff partner proud of his compliance. I was so blown away by this young man's handling of the situation that I pulled him aside later and expressed my admiration. You can't help but see the correlation in the aforementioned scenarios that these siblings are truly gifted with a unique sense of empathy that translated into an incredible rapport with these individuals with special needs. I remember a conversation I had with a mother of a young girl with Down syndrome. She was telling me that she hired a teenager whose sister has Down syndrome as her children's' babysitter. 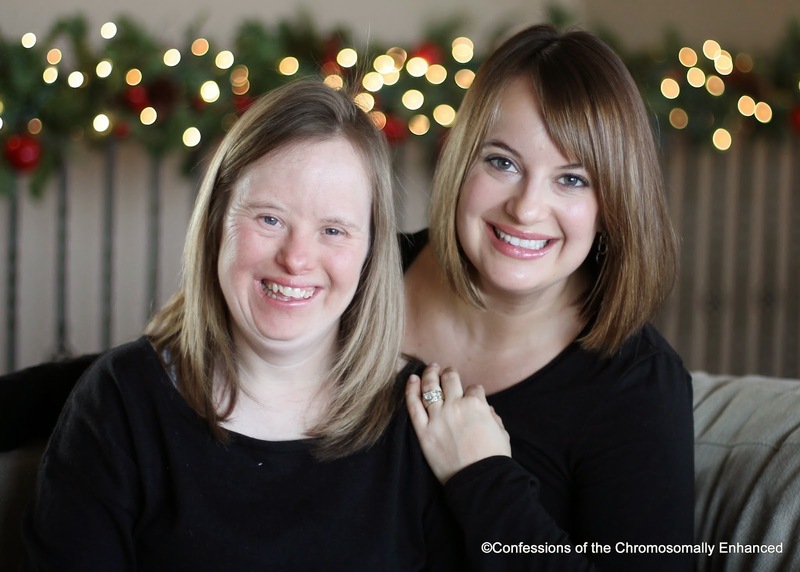 She said she loved this particular babysitter because she wouldn't let her daughter get away with bad behavior just because she had Down syndrome. She didn't feel sorry for the little girl with Down syndrome nor would she allow that to be an excuse. The babysitter would make her daughter comply, take turns, and help clean up - just like she did with the other kids. She felt like this babysitter's insight into the sibling dynamic made her even better equipped to handle all of her children with equality and fairness. In pasts posts about the sibling dynamic, we've explored the idea that a healthy sibling relationship doesn't come from forcing responsibility for the sibling with special needs upon the typically developing sibling. But I think I gained a lot through the opportunities to be around other individuals with special needs. Not only did it reiterate the idea that I was not alone, but it also helped me gain a sense of compassion for individuals who have various disabilities without being solely responsible for my sister's direct care. My mom made a concerted effort to instill a sense of philanthropy and altruism in both Leanne and myself and I am forever grateful for that. We were both expected to volunteer our talents to help with Meals on Wheels, decorating the church for Christmas, and various other charitable initiatives. However, I think the opportunity for me to spend time helping others with special needs helped me develop a sense of compassion for my own sister and it truly lit a spark in me to want to continue to be involved in the special needs community. During college, I worked at a developmental center for kids with special needs. Travis and I also volunteered with a wheelchair basketball league. We later volunteered with a Special Olympics volleyball team and have continued to remain involved with various charities that benefit the special needs population. I thanked my mother yesterday for facilitating this exposure to the special needs population outside of the home because I feel like it made me more comfortable within the special needs community and it instilled a true appreciation for the diversity of the human condition. We aren't all the same; everyone has a different set of strengths and weaknesses and that's a good thing. Because everyone - regardless of IQ or physical aptitude - has something to offer. It's not a coincidence that having a sibling with special needs increases the likelihood that an individual will choose to pursue a career in a "helping profession" such as teaching, therapy, or social work. It is not a coincidence that Dr. Skotko has devoted his professional career to studying Down syndrome. And it is not a coincidence that I grew up with a sister with Down syndrome and made the decision to adopt a daughter with Down syndrome. With a concerted effort towards positive exposure to the special needs community, I truly believe "inspiration" will prevail over "resentment" within the sibling relationship. Beautifully said! Love all the pictures! Great post! I always enjoy reading your blog and the adventures about Leanne and your daughters. Thank you for writing this post. I think I'll probably come back and reference it many times in the coming years. 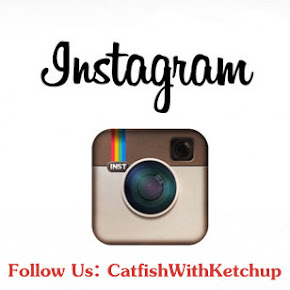 Thank you for being willing to share your experiences and wisdom with us! Yes to all of this! I have a younger brother with special needs and being involved with the special needs community has helped me become a better sister who is more involved with his care and has more insight into what else we could be doing to help him reach his maximum potential. Being involved with him has made me a better camp counselor, nanny, and person. I really enjoy reading your posts about being a sibling!